Last Updated Apr 2019 – Easily the most distinctive type of pasta, ravioli holds a special place in the hearts and stomachs of pasta lovers worldwide. While spaghetti, fettucini, and penne are simply different shapes of the same dough, ravioli offers new versatility with the addition of flavorful stuffings. When each piece of pasta embraces delicious meat, cheese, and herb blends, you’ll be able to craft a bountiful array of new recipes in your kitchen. In order to make ravioli, the wonderful lobster stuffing you’ve created needs to go inside a doughy square. 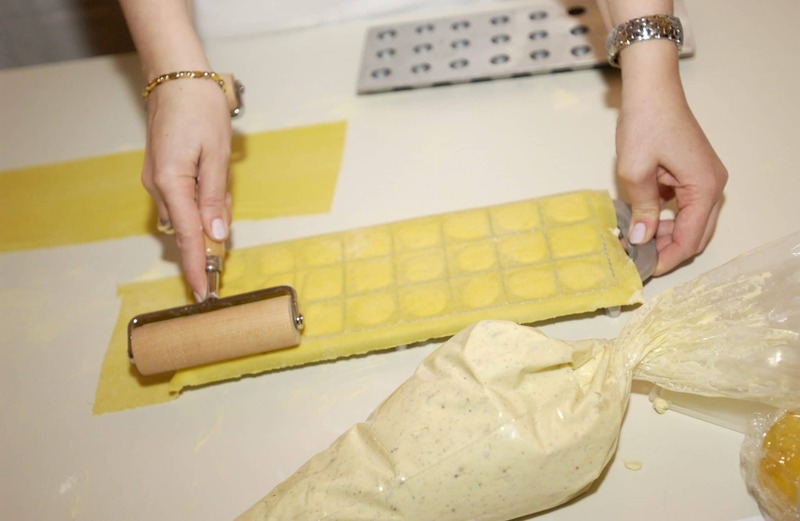 While you can make these squares with a rolling pin and knife given enough time, it’s much easier to utilize a dedicated ravioli maker to create your ravioli shapes. Not only will you save a lot of time and effort, you’ll also get the same wonderful zig-zag edges you see at restaurants. When searching for a ravioli maker, one of the most important considerations is the flexibility each machine affords you when it comes to making other types of pasta. If you already have a pasta machine, it’s fine to get a simple mold and cutter to create your squares. If you don’t, however, it’s probably a better idea to get a more general pasta maker that has an accessory that will help you make ravioli. If you're looking for an ultimate answer to all of your pasta making needs, choose this pasta maker. If you’re a fan of customization or you don’t want a pasta machine, these molds are a great option. If you’d like to have full control over your stuffed ravioli, this kit is perfect for you. This VonShef product is the ultimate answer to all of your pasta making needs. It comes with a range of attachments that allow it to press lasagna sheets, cut fettuccine or spaghetti, or cut ravioli. While it’s a bit overkill if you already have a pasta maker, it’s perfect for any kitchen without one. VonShef isn’t very vocal about it, but the actual pasta machine that’s included in the box is the Imperia 150. 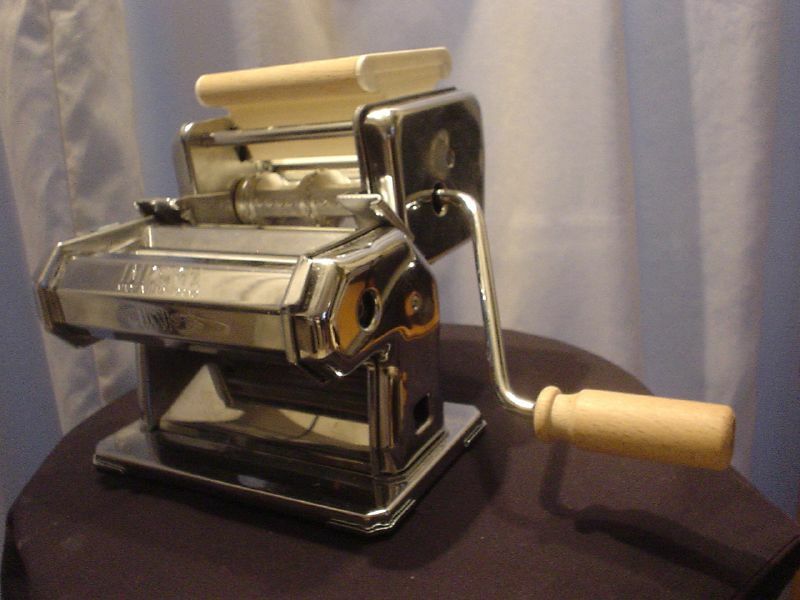 Made with genuine Italian parts, the Imperia 150 is one of my favorite pasta machines. It produces restaurant quality pasta every time. Strangely, it’s often more expensive to get the Imperia machine on its own than it is to get this VonShef box with all of the attachments you need. You’ll be able to make incredible pasta in no time. One of the major complaints about crank-driven pasta machines is the fact that you need one hand to hold the machine down on the counter. VonShef has helpfully included a basic clamp to help alleviate this issue. It’s not perfect, especially if you have thicker counters, but it will go a long way towards helping you use this machine on your own. Even if your counters prove too big for the included clamp, you can always pick up a few parts from your local hardware store to make things fit. The cutter attachments for various thicknesses of noodles work excellently. It only takes a couple minutes to press pasta dough into sheets and then cut them into perfectly even noodles. You won’t just use this machine for ravioli. Instead, you’ll get a lot of value out of every single one of its features. When it comes to the ravioli attachment, this VonShef has everything you need. A first pass through the pasta maker will give you sheets of dough at just the right thickness. After a bit of prep work, the machine will take these sheets and do all of the cutting and pressing for you. It will even portion out the filling and automatically place it inside of each pasta square. 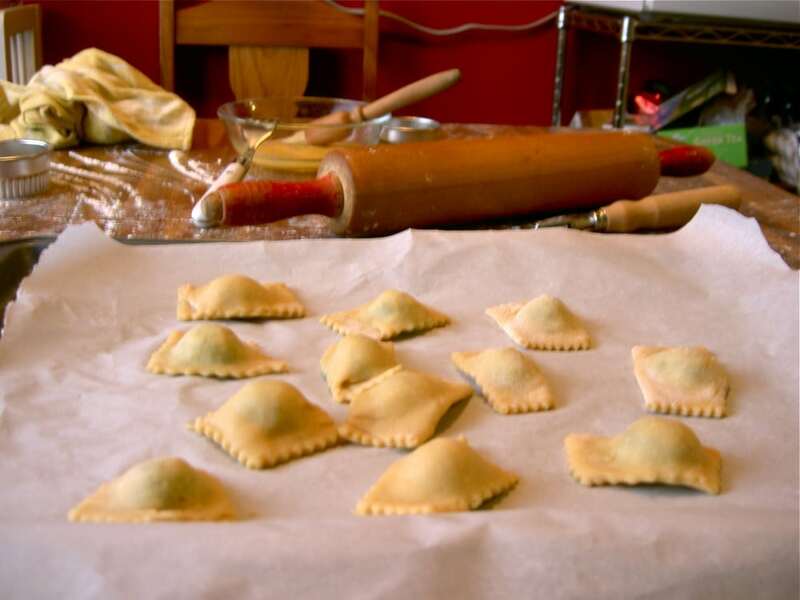 With a bit of practice, you’ll be able to make ravioli in an incredibly short amount of time. I cannot stress how fast this machine is compared to cutting the squares yourself or using a mold. Normally, you have to cut the sheets, spoon in filling, and press the squares together. This machine does all of that. You simply spoon a bunch of filling into the top and crank. Best of all, each square will be evenly cut with well-sealed edges. One tip: machines like this one work best with slightly dry pasta and a moist filling. This helps ensure that the machine can portion out filling easily and seal each pasta square. If you have trouble getting your machine to distribute your filling or seal the squares, try letting your dough dry for a bit and adding a bit of moisture to your filling before you begin. The convenience offered by this crank-driven pasta maker cannot be beaten when it comes to making ravioli. 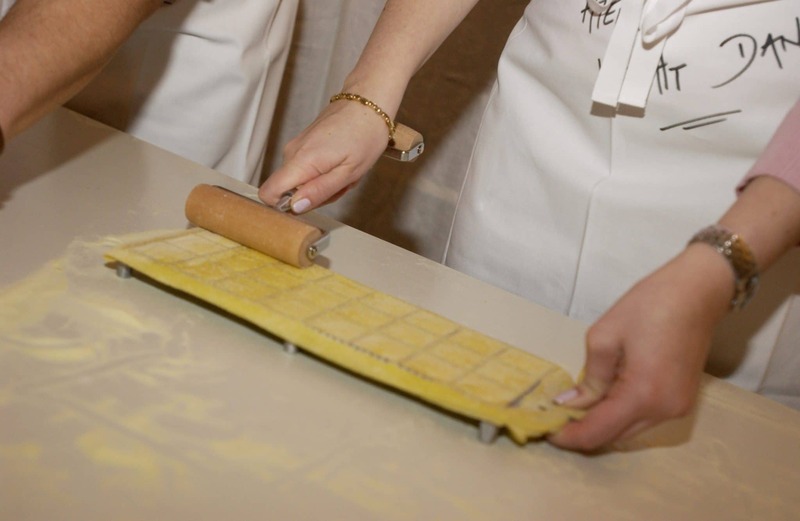 Because the ravioli making process begins with two sheets of thin pasta dough, making ravioli by hand requires you to painstakingly roll out your dough with a rolling pin or use a machine like this one. 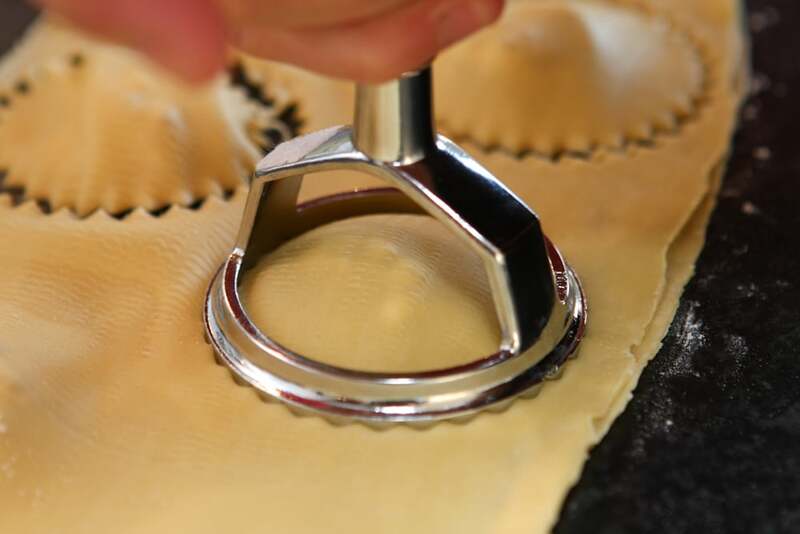 Even before you use the ravioli attachment, you’ll have saved a lot of time by quickly cranking out thin, even sheets of dough. 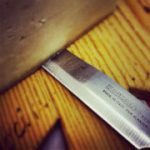 Once you’ve done that, however, you’ll be able to quickly set up the attachment, dump in your fillings, and simply turn the crank to produce perfect ravioli squares. If you’re looking for more options for your ravioli, this set of authentic Italian pasta molds is a great place to start. Imperia is a well-known name in the pasta-making business, and they provide three incredible molds in this set. While you’ll probably still want a pasta machine to roll out your dough (or at least a bigger rolling pin), the molds included here will enable you to quickly produce even ravioli in multiple shapes and sizes. Using these molds requires a touch of finesse. You’ll want to sprinkle them with flour and then press pasta dough into the molds with a rolling pin. 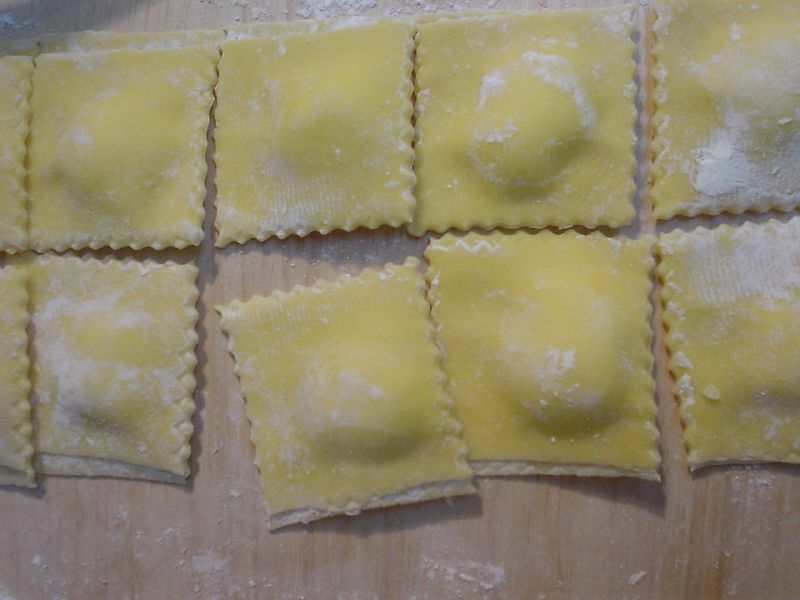 With a bit of practice, you’ll be able to pull out perfect ravioli shapes. You’ll need to add filling and press the shapes together by hand. 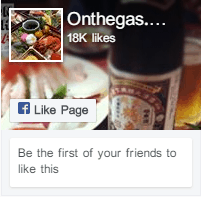 For a lot of people, though, that’s a lot of the fun. This set comes with three molds. One produces small square ravioli with a square indentation for filling. One produces larger square ravioli with a round indentation for filling. The final mold produces triangular ravioli with a triangular indentation for filling. The triangular mold is the hardest to use, so be sure to figure out how dry your dough should be and how much flour to use with the other two before moving up to it. 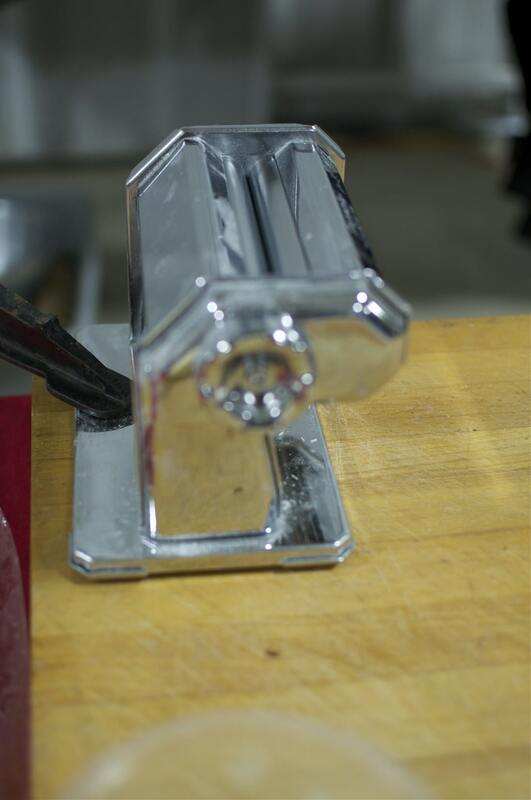 The molds are made of high-quality stainless steel and have rubber feet on the bottom to prevent them from slipping around the counter while you work. Unfortunately, the rolling pin included with this set is fairly lackluster. You’ll almost certainly want to use a larger pin with this set, both to roll out your dough and to press it into the mold. While this set enables you to make squares (or triangles) fairly quickly, it’s nothing compared to the speed that a ravioli attachment like the VonShef will give you. If speed is your only goal, be sure to choose an attachment over a set of molds. If you’re looking for more customization or you don’t want a pasta machine, these molds are a great option. 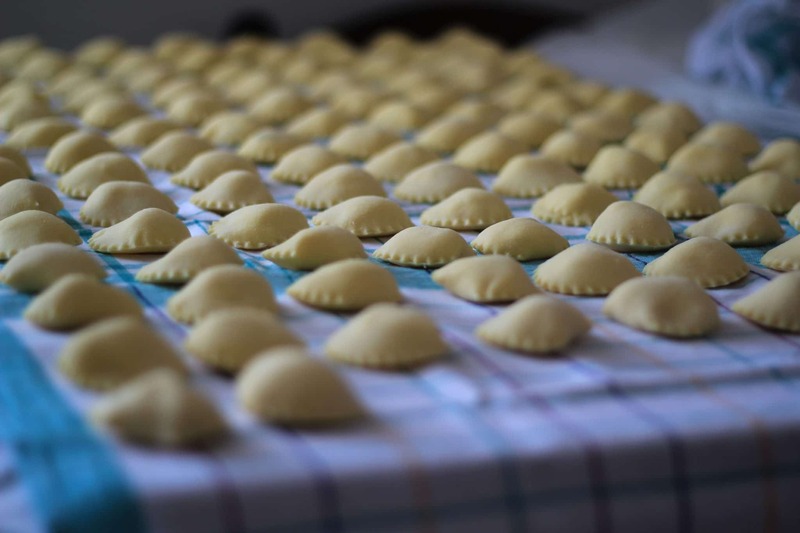 Producing ravioli involves two big steps: pressing your pasta dough into sheets and cutting that dough into ravioli shapes. While this kit won’t help with the first step, it gives you the ability to quickly produce ravioli in a variety of shapes once you’ve gotten your pasta pressed. The options it presents make it a great addition to any kitchen, even one that already has a pasta maker with a ravioli attachment. The Imperia kit above offers you three molds to give you perfectly even ravioli in a variety of options. This William & Douglas set eschews molds entirely and puts all of the control in your hands. It comes with a pastry roller, crimper, wheel cutter and two stamps, allowing you to shape your own ravioli from pasta sheets of any size. 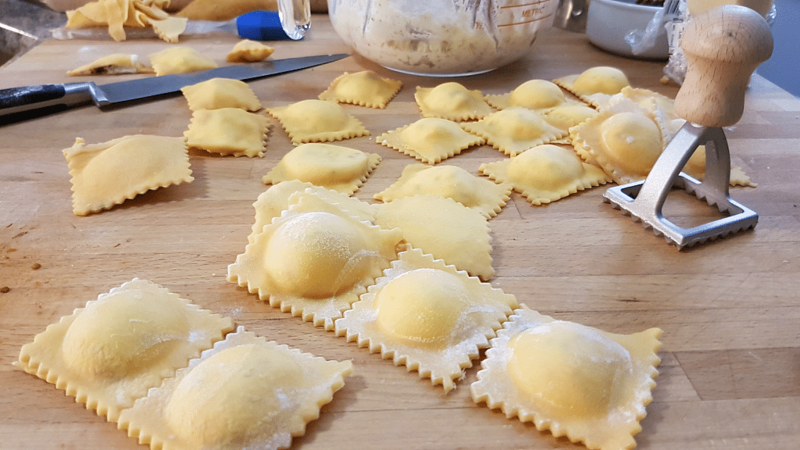 While you might not get the same perfectly even results as the Imperia mold, you’ll be able to produce your ravioli exactly the way you like it every time. One of the advantages of this ravioli maker set over the other options we’ve presented is the ability to make other kinds of stuffed pasta. Both the Imperia mold and the VonShef attachment make the same ravioli squares (or triangles) every time. With this set, you can make stuffed pasta in any shape you desire. The wheel cutter enables you to be infinitely creative with shapes, while the square and round stamps mean you can still get ravioli that’s the same size every time. Like the Imperia mold, this set will work best if you have a pasta machine to roll the pasta out beforehand. Unlike the Imperia mold, however, the pasta roller that comes with this set is somewhat serviceable. You’ll still be a bit better off with a full sized rolling pin, but I’ve used this pasta roller in a pinch. When you’re rolling your dough by hand, you’ll often produce pasta sheets in funny sizes and shapes. Using one of these sheets with either the molds or the attachment above will result in a lot of excess dough that you’ll have to re-roll in order to use. Not so with this kit. You can stamp out ravioli circles or squares any way you like, allowing you to efficiently use pasta sheets in any shape or size. Similarly, the wheel cutter can be used to cut these misshapen sheets into any form you’d like. While it will take some time to cut each sheet of pasta with either the roller or the stamps, you’ll save quite a bit of time by not having to worry about the size and shape of your hand rolled pasta sheets. If you’d like ultimate control over your ravioli or you’d like a set that pairs well with hand-rolled pasta, this William & Douglas kit is perfect for you. It’ll still work best when paired with a pasta machine, but if you’re not ready to put one of those in your kitchen, this kit is your best choice for making ravioli. Best of all, it can be used for making empanadas and other types of filled pastries in any shape or size. When it comes to quickly producing even ravioli squares, the VonShef pasta maker is undoubtedly the best choice. Not only does it quickly press pasta dough into sheets, it also cuts and presses your ravioli while measuring and distributing filling. In other words, it does almost all of the work for you! With the VonShef machine, you’ll be able to produce dozens of ravioli squares in just a few minutes. This isn’t to say that the other machines don’t have their place. If you need to produce even ravioli in different styles, the Imperia mold kit is a great option. It pairs especially well with an existing pasta machine since the machine will be able to quickly press the dough so you can use it with your mold of choice. The William & Douglas kit offers an even more impressive variety of options to home chefs that enjoy making stuffed pasta and pastries of all types. The wheel cutter from the kit is a valuable tool that works well with any sort of pasta machine, even one with a ravioli attachment, and you’ll get a lot of use out of the different stamps and pasta roller. So which machine should you buy? If you want to make multiple types of pasta (like spaghetti or lasagna), the VonShef is the clear winner. You’ll be able to make all sorts of authentic Italian pasta. If you’re just looking to expand your ravioli horizons, the other two options might be better for you. Choose the Imperia if you prefer making even squares more quickly, or the William & Douglas if you’d like more customization at the cost of speed. No matter what you choose, you’ll be making delicious ravioli in no time at all!